Due to the compact dimensions, OUT69 CN is suitable for mounting into the terminal box of an electric motor. It is characterized by high reliability and availability. OUT69 CN Motor protector matches with PTC sensor and is available for all kinds of motor which needs protection, preventing overheating of the electrical machines. Up to 9 PTC-sensors according to DIN 44081/082 with different nominal response temperatures can be connected in series to the measuring circuit input of OUT69 CN. Hence it is possible to monitor several motor drive units (e.g. motor windings, gear drives, shaft bearings) for thermal overload with only one OUT69 CN motor protector. If the temperature in one of the areas monitored exceeds the nominal response temperature of the respective PTC-sensor, the sensor resistance increases and the OUT69 CN motor protector switches the motor contactor off. After cooling down below the reset threshold, a 5-minute delay period begins. When this period has expired, the module automatically starts to monitor again. 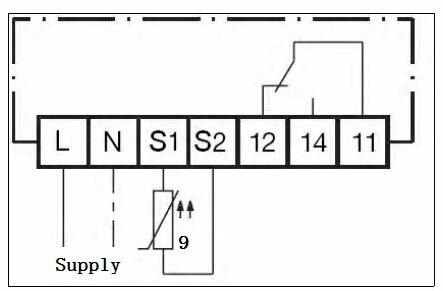 The relay switch output is designed as a potential free change-over contact. Copeland Part-No.071-0581 Use for compressors, such as Dunham-Bush.